The struggle against the ongoing marginalization of students and the exploitation of workers at one of South Africa’s historically black universities. Throughout 2015, on our campus outside central Cape Town, we were involved in an uprising around tuition fees, outsourcing and student accommodation. Unlike the elite “white” campuses, such as the nearby University of Cape Town or Stellenbosch, where campus struggles often took on a symbolic form, ours was a struggle against the ongoing marginalization of students and the exploitation of workers at one of South Africa’s historically black universities. This marginalization was apparent in the absence of media coverage of our struggle, until dramatic scenes of police violence played out on national television. I am becoming rector at a time when the crisis of authority, the crisis of validity – some people call it the crisis of legitimacy – of the state and the government is not any longer just a theoretical construction but is written in huge letters in every house, every school and every university. Today we once again find ourselves confronted by a state that is increasingly paranoid, repressive and facing its own crisis of legitimacy. Off-campus the growth of protests against the lack of services, housing shortages and rampant unemployment occurs against a backdrop of corruption, patronage and state capture. Over the last month, we’ve reflected on the dramatic events on our campus, exploring the themes, contradictions, highlights and tensions that emerged and are ongoing. 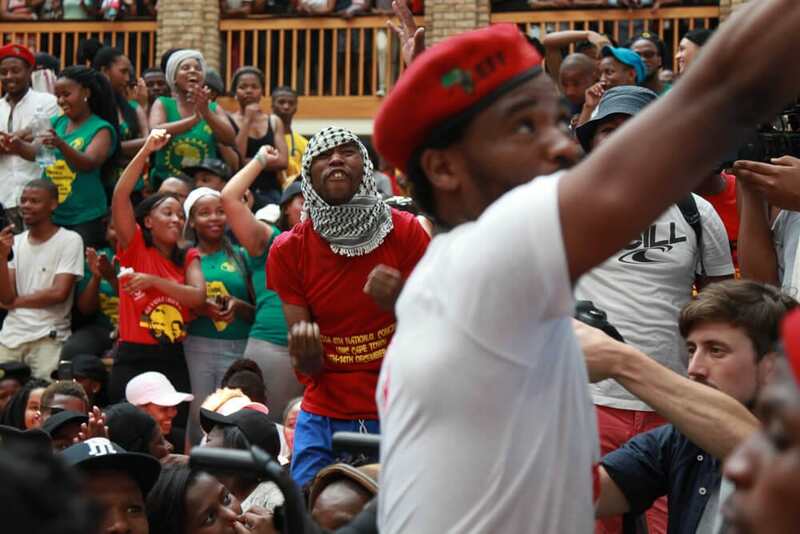 From these reflections we have compiled a report that highlights the experience of students at UWC during the #FeesMustFall struggle and some of the unresolved issues, particularly the question of labor outsourcing. Our report draws attention to the differential experiences of students at UWC in a number of ways. First, the spatiality of UWC is such that it is strongly shaped by apartheid geographies of race and class. Located on the edge of Cape Town and surrounded by colored working class neighborhoods, the campus itself was designed to be locked down in the event of protest action. Like South Africa’s townships there are few entry and exit points. The university administration and reactionary elements among the student body also attempted to use socio-spatial divisions between black and colored students to demobilize our movement. Like other campuses the ruling party, the ANC, and its allies used a variety of smear tactics to discredit the intellectual capacity of students, insinuating that we were led by some shadowy “third force.” This apartheid-style paranoia was reinforced by the militarization of our campus by security forces, some of which have direct ties to the old racist regime. Like other working class campuses, our struggle has foregrounded the role of outsourced workers. Interviews with workers reveal that they make poverty-level wages, and commute long hours to work each day. Ours is not a selfish struggle for lower tuition, but one that speaks to the ongoing oppression of black workers across this country. Our university holds vast archives of the liberation struggle. There is however, a crucial difference between these archives and our report. Ours is a living archive, a document of a struggle that is ongoing, not a dusty memento of struggles gone by, and one that will intensify in the coming years. We are not interested in lionizing heroes or waxing nostalgic. We are developing the theory necessary for a new generation of activists to take the struggle forward.